Everything had just been unloaded from the uhaul into my apartment and I was exhausted. I had started my day in Pooler GA where I woke up early to return my rental car, pick up a uhaul, have it loaded then drive to Greenville SC. All I wanted was a nice hot shower in my new apartment. I hung up the shower curtain and proceeded to turn on the water to warm it up. This is when I came across the first problem. Before we delve into that, we need to talk about mass balances. 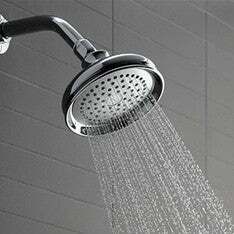 Normally, under steady state conditions, in a shower you should be removing water at the rate you’re introducing it into the system; therefore, in should equal out. In my case, in didn’t equal out; there was an accumulation term. There was standing water in my tub while I was showering, not good. When I opened my mail box for the first time, I noticed two names on the card telling the postman who lived there. One name was male and the other was female. I can probably assume that at least one of them, if not both, had long hair. The hair from one of the former residents was creating my accumulation term. Before we talk about fixing my accumulation problem, we need to talk about the second problem I noticed, there was hardly any water coming out of shower head. There was hardly any pressure at all. It was was abysmal. I would need to investigate more to see what the issue was. After my shower I used my sink in the bathroom where I realized there was adequate pressure; probably meaning that the supply to the shower head wasn’t the issue. The was confirmed when I took off the shower head and turned the shower on and there was, once again, adequate supply. Looks like I had found the source of my lack of water, there was a restriction in the shower head. Now before I can think about introducing more water into the system, I have to solve my accumulation problem. This was done by submitting a maintenance request; this is one thing I like about apartment life, I don’t have to do maintenance work. The day after I submitted my maintenance request, I come how to a note left on my counter saying the maintenance staff had removed hair from my dream; my accumulation problem had been solved. This was confirmed by turning on the water on and watching in amazement as my drain actually drained. Perfect, now I could look into my supply problem. Since I had narrowed my supply problem to my shower head, it was time to throw some money at the problem. I went to home depot and bought a new shower head. Upon arriving home, I installed the new shower head. When I turned on the shower, I was not pleased. While flow had been improved, it was still not to my satisfaction. Alright what am I going to do now? Well, might as well take the shower head that came with the apartment apart. This is when I see a nice flow restriction in the shower head. It’s a little piece of plastic deliberately put there to restrict flow. Perfect, I grab a screw driver and pop it out. After reassembling the shower head, sans restriction, I reinstall the shower head. This time I turn the shower on and am happy with the results; I finally have good pressure. In fact it’s almost too much, which we’ll talk about in a moment. Before we address the too much pressure issue, we need to talk about the next problem I ran into. Now that I had greatly increased the rate at the shower head, I had also greatly increased the rate at which I was using the hot water supply. I was now running out of hot water in the middle of the shower. I have a tank water heater, which has a finite capacity. I couldn’t change the volume of hot water that I started with; however, I could change the rate at which I used the hot water. Basically, if I made the water hotter to begin with, I would need less of it to get it to the right temperature. We could go over the energy balance, or we could just agree that heat is a manifestation of energy and that if I want to a smaller volume of water to make something the same temperature, it has to be hotter to begin with. So where does this leave us? I would need to turn up the temperature on the water heater. Problem is that it’s behind a locked door, to which I do not have a key for. Again, this problem was solved with an email to the maintenance department. To my surprise, they actually came and turned up the temperature. I figured they might not because the water can actually scald you now, and there might be some liability issues, but nope they came and turned up the temperature. Great, now three issues had been solved and I had a nice comfortable shower. I lived with the shower like this for a couple weeks before I decided to redress my shower head. I did this by taking apart the shower head I had bought. It also had a flow restricter in it. Now, I didn’t want to remove it because with it removed, it was too much water. This is when I realized that if I could remove part of it, I could increase the flow to what I wanted. So, I got my drill out and picked a bit that looked like it would give me a nice flow and put a hole in the middle of restrictor. I then reassembled the shower head and installed it. Now while it was giving my the flow I wanted, it was also leaking from the threads. The original shower head was just screwed on and figured that would also work with the shower head I worked, but apparently the fit wasn’t sealing. Once again, time to throw money at the problem. I went to home depot and got a roll of PTFE tape. Taped up the threads and put the shower head on. Now I finally had a shower with a working drain, an adequate supply of hot water, and shower head to supply it at the pressure I wanted. Perfect.